A patented and UL Recognised, metal-stamping-based system for connecting wires to surface-mount printed circuit boards features many advantages, including reduced production costs, improved reliability, and faster processing speeds. The solution combines the benefits of crimping, insulation piercing, and surface-mount technology to provide an effective method for terminating wires. 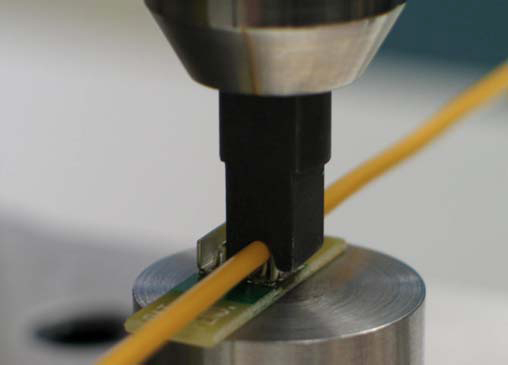 Zierick developed the system as a means of helping electronics manufacturers achieve miniaturisation goals without compromising connection reliability, given that wire-to-board connections represent one of the more costly and trouble-prone steps in electronic packaging. Zierick’s SMT insulation-piercing crimp terminal consists of two insulation-piercing contact spikes that protrude from a flat base and two sidewalls that are perpendicular to the base. The connector also features two deep grooves in the transition area between the crimp ears and the terminal base. These ensure that when a wire is crimped into the terminal and the crimp ears are formed around the wire, the solder joint on the circuit board is not subject to stress cracking. Inside the terminal, between the two contact spikes, there is a flat area to facilitate vacuum pick-up of the terminal by surface mount placement systems. The connector design allows use in either applications where the wire passes through the terminal for serial connections, as in channel block lettering with LEDs, or for termination of flying leads permanently attached to a circuit board. 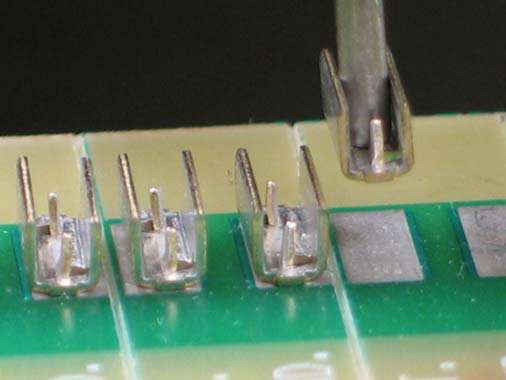 The SMT crimp terminal has a unique flat base for excellent solder adhesion when surface mounted. This allows it to be placed on, and soldered to, the PCB with all the other components, using the same process and the same automated system. Once the terminal is attached to the PCB, the wire can be crimped at any time, either on the assembly line or in the field. No stripping of the wire is required. The wire is simply placed in the terminal between the crimp ears. The terminating tool wraps the crimp ears around the wire, pushing the two spikes into the centre of the wire, ensuring a good electrical connection. Insulation does not need to be stripped from the wire prior to termination since the connection is made when the insulation piercing spikes are forced into the wire strands. 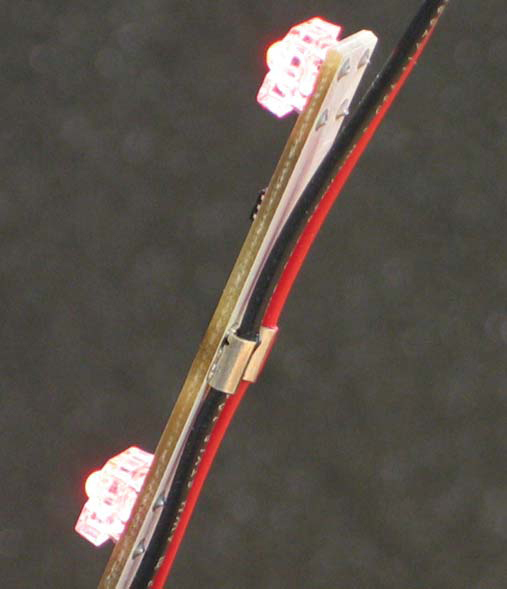 The curved terminal crimp-ears keep the spikes inside the wire and provide strain relief for the conductor. 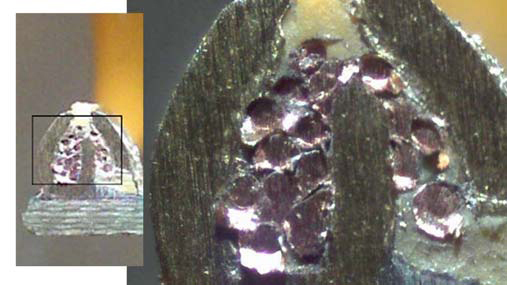 This insulation piercing process requires significantly less force to terminate a wire than conventional crimping, thereby minimising shock load on the PCB assembly. This process provides a reliable connection through a large range of crimping forces. It is not crimping-force sensitive and can accommodate variations of PCB and solder thickness. Zierick sells both the connector parts and the automation necessary to perform the attachment operation. Applications for these terminals include low-voltage lighting, instrumentation, digital picture frames, motorized bed controllers, digital thermostats, motorized wheelchairs, automotive lighting, security systems, thermal sensors, and traffic signals. Zierick continues to expand this line of interconnects and now offers versions that cover wires ranging from 24-12 AWG, as well as a version for ‘zip-cord’ cable. The development of the system earned Zierick the Higgins-Caditz Design Award in the annual Awards of Excellence in Metalforming competition conducted by the Precision Metalforming Association.